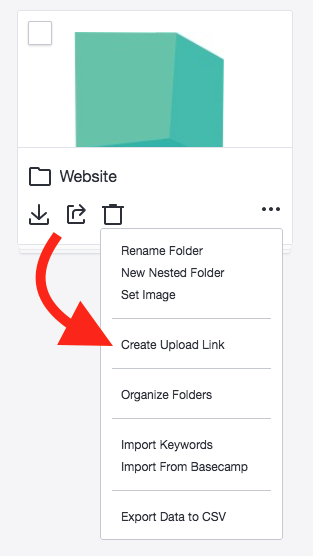 Use the upload link to get outside users without a username and password to upload content to a specific folder. A direct folder Upload Link will allow your contact to upload content to your library even if they do not have an account. Perhaps this is a vendor who has to deliver a logo or another large file. Or a photographer only working on one shoot for you, who does not need their own account. This also keeps all files within your library ecosystem. Locate the folder you want to link to in the left folder tree navigation. Hover over it, and click on the Elipse icon to the right of the name. Click on Create Upload Link. You can quickly grab the default link and send it off! Gathering the uploader's information is always preferred. You will get more context on what is being uploaded and by whom. This information will be sent via email every time an upload has been made. The time stamped folder will organize content into a unique folder with every upload. It will carry over the uploader's initials, time and date that the upload occurred. You can set a Link Expiration date if needed so that the link will not longer be active after that specific date. You can also customize the URL in the Advanced Options of the modal. The link creator will be notified via email when content has been uploaded, including information on how many files were uploaded (and by whom if tracking information was requested).